Good Stuff NW: In the News: Just How Many Maggots Are In that Tomato Juice, Anyway? In the News: Just How Many Maggots Are In that Tomato Juice, Anyway? In a fascinating (if occasionally repellant) article titled "The Maggots in Your Mushrooms," E.J. Levy enumerates the "defects" that are allowed in our food by the FDA. Like tomato juice, which "may average '10 or more fly eggs per 100 grams [the equivalent of a small juice glass] or five or more fly eggs and one or more maggots.' Tomato paste and other pizza sauces are allowed a denser infestation — 30 or more fly eggs per 100 grams or 15 or more fly eggs and one or more maggots per 100 grams." 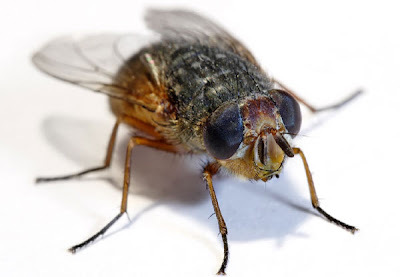 Levy sums it up by saying, "In case you’re curious: you’re probably ingesting one to two pounds of flies, maggots and mites each year without knowing it, a quantity of insects that clearly does not cut the mustard, even as insects may well be in the mustard." Thanks for sharing. I think.